I'm not gonna lie, it took me a while to jump on the (faux) leather jacket bandwagon. I think I always thought I wasn't quite cool enough and that a leather jacket wasn't quite 'me' being the casual soul that I am. ﻿Turns out it's actually a pretty handy addition to my wardrobe as it can be worn with a casual outfit (which is me 99% of the time) but can also be worn on an evening with something slightly more dressy. I've worn mine so many times now over jeans and t-shirts, dresses, blouses - the list is endless because it goes with everything bar my faux leather trousers because however much I wish I was, unfortunately I'm not Buffy. 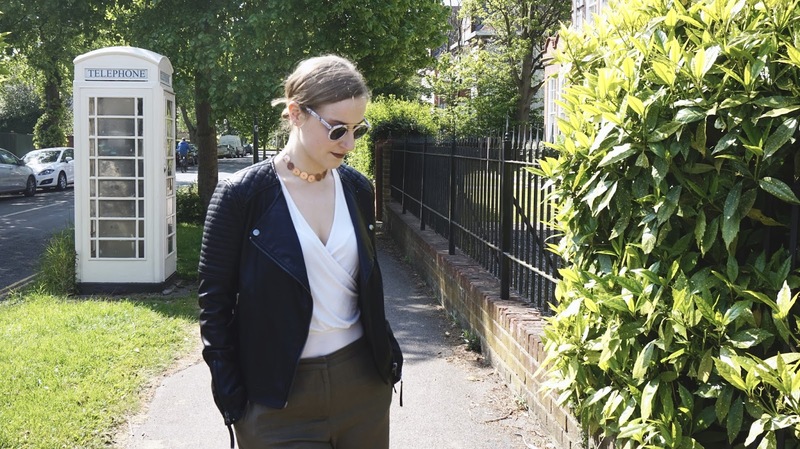 I spent a long time finding a leather jacket that suited me and my style and basically went for the most casual one I could find (obviously). It's from Topshop which I knew wouldn't let me down when I was on my hunt because it's the one shop that never ever fails for me. I love that it doesn't have a collar because it makes it much easier to wear with anything and does make it look a little more casual and I love the quilted detail because who doesn't love anything quilted? The quilting also means that it's super comfortable to wear and we all know I'm all about that comfy life. 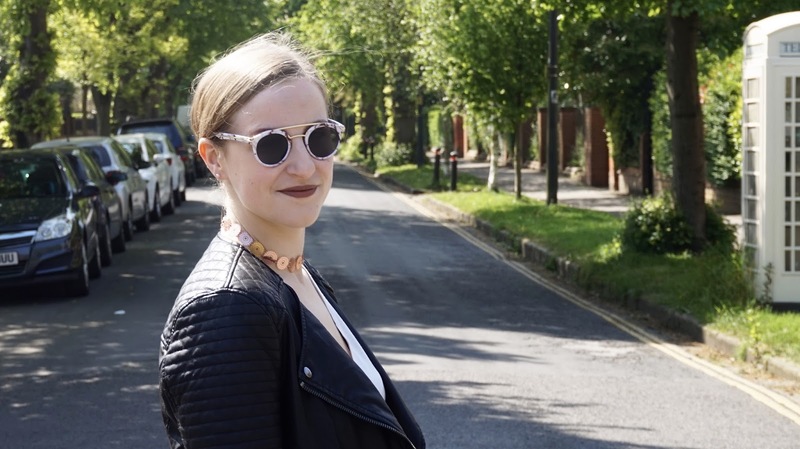 A faux leather jacket is perfect for this time of year when it's too warm for a coat, but the weather still hasn't quite made its mind up yet. 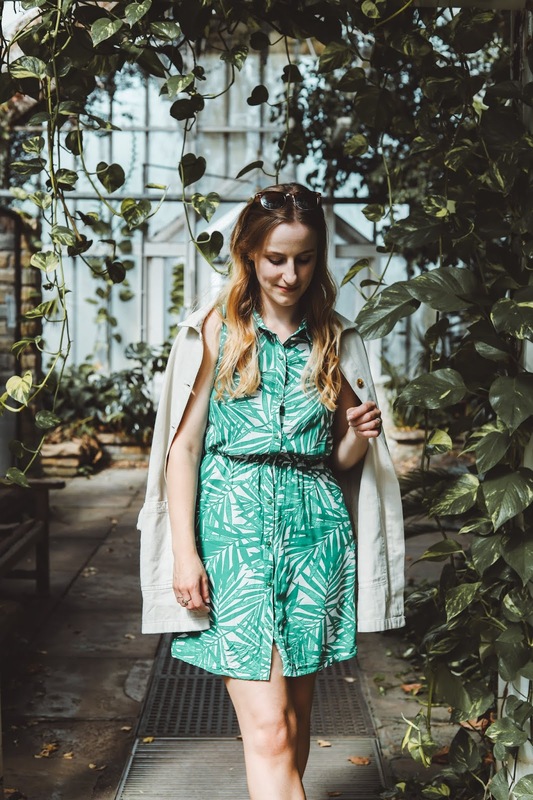 I was surprised at how warm it actually is as a cover up, which is great for spring and summer evenings when you still want to sit in a pretty beer garden but don't want to pretend you're enjoying yourself when you're actually freezing your socks off. The rest of my outfit is fairly simple and mostly made up of older pieces. I've felt so much more comfortable shooting older outfits recently - sometimes it feels like there's a certain amount of pressure as a style blogger to constantly have something new and exciting to show, when actually it should also be about what I'm actually wearing day to day because I do have a lot of older clothes in my wardrobe and however it may appear on my Asos account (ahem), I'm not always buying new clothes that I can feature. 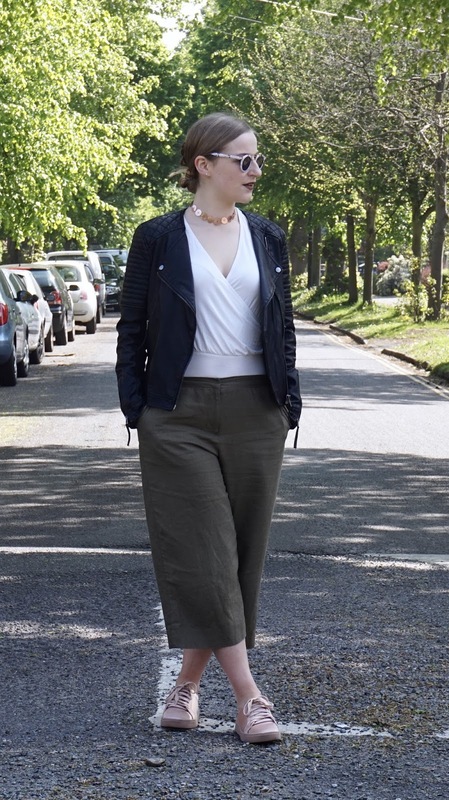 It finally seems like the right weather to bring out the cropped trousers again (although my legs are so short you can barely tell these are supposed to be cropped) and I've rediscovered this wrap body that I was obsessed with last year as it's super comfortable and looks great tucked into everything. Unfortunately about ten minutes after these pictures were taken I spilt coffee all down it and had to dash home and change before work #glamorous. Are you a leather jacket fan? My Mum bought me a faux leather jacket as a Christmas gift when I was about 14 and I still have it to this day! I love it because I can dress it up and down, it looks great with a little black dress, and equally cute with jeans and a tshirt! 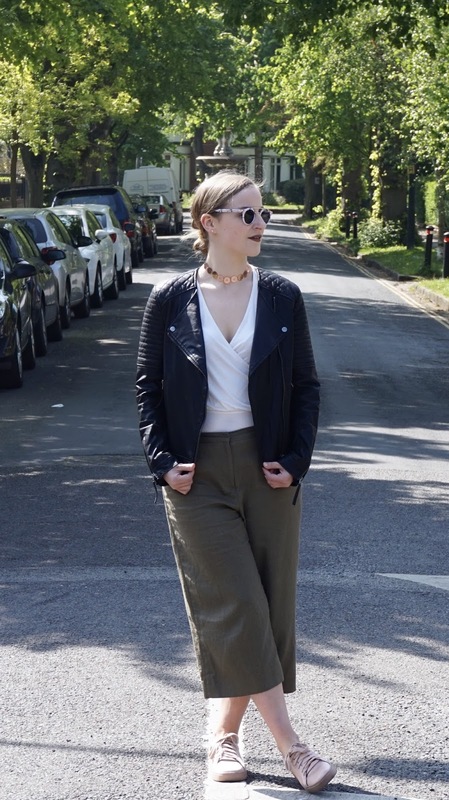 I love your culottes, they really suit you, and you look as effortlessly cool in your photos as ever! What great pictures and such a lovely location too. I didn't think a leather jacket was 'me' or 'my style' either but I'm slowly changing my mind!! Thanks for the ideas and info! Love these photos and you look great in that jacket. It is definitely the right one for you. Hope you are having a great start to your week. GIRL, HOW SASSY DO YOU LOOK? Seriously though, you look incredible in this!! I loved your jacket! It never fails to give glamour to any outfit! I am glad you found one that you liked! Faux leather is very nice! I also loved the culottes or cropped trousers! I guess you are right, they are cropped trousers, not really culottes! You look very beautiful!